Sony PS2 - Gadgets Info. 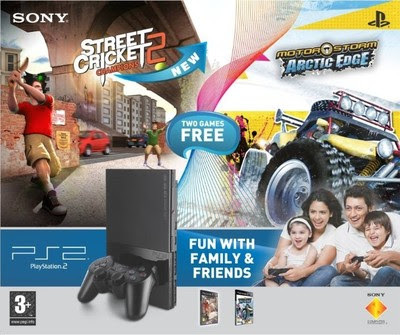 You can quench your Need for Speed, sweat it out for Brothers in Arms or rule the Caribbean as a Pirate from your living room with Sony PlayStation 2. This sixth generation video gaming console has been designed to be a complete home entertainment package to be enjoyed by the whole family. Running on Emotion Engine processor that accurately produces high resolution 2D and 3D graphics, making game play on the PS2 a one-of-a-kind experience. Adding the final touch to your home entertainment, the Sony PlayStation 2 has an inbuilt DVD and CD player with which you can enjoy movies, TV series and music. Measuring 230 x 28 x 152 mm, this console is slender. You can make it stand or lie flat in the TV unit as it requires minimal space. Weighing merely 900 g, you can carry the Sony PS2 console to your friend's house with ease. The Sony PlayStation 2 requires 8.5 V power to function and consumes 5.3 A of electrical current. The console houses several connectivity ports that help you increase the overall functionality of the device. The front of the console holds 2 Controller ports, 2 memory card slots and 2 USB connector ports. On the rear of the console you will find a Network connector, a DC IN connector, an AV Multi Out connector and a Digital Out connector. It also comes with ethernet and modem ports. For PlayStation one console owners, your collection of games will still work perfectly when you upgrade your home entertainment to the PS2. The Sony PS2 is backward compatible, which means it will play PlayStation one games without a glitch. You will also enjoy quality audio as this gaming console from Sony is well equipped withDolby Digital AC-3 and DTS sound features. Multi-player games bring a whole new dimension to gaming. There are several games categorized under genres like role-playing, puzzles, strategy action and others that support multi-player gaming. Using the Network connector port, you can connect your PS2 to the Internet and gain access to the plethora of such games. To expand your battlefield to the breadth of the world, simply connect to PlayStation 2 Online. You can hone your skills as well as get competitive with players from several countries by initiating or joining multi-player games. The PS2 ships with a DUALSHOCK Analog controller that has pressure sensitive buttons of 255 sensitivity levels. Ergonomically designed, this standard controller does not strain your hands or fingers. The right side of the controller houses the all-important action keys, that will let you kick, shoot, punch or accelerate according to the game playing. On the left side, you will find the direction keys, also known as D-pad, which lets you maneuver the character or vehicle in the game playing. The controller also holds two analog thumbsticks for gamers strategically placed to be used by those opposable thumbs.